Philip Morris Japan (PMJ) is the first Philip Morris affiliate outside of Switzerland to receive the EQUAL-SALARY certification. Philip Morris International became the first multinational company in Switzerland to be certified as a provider of equal remuneration for women and men in 2015. This new milestone reinforces the company’s strong commitment to diversity and inclusion. 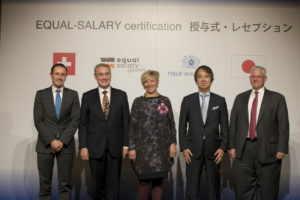 Following PMJ’s successful completion of the certification procedure, the EQUAL-SALARY label was awarded today in Tokyo by Véronique Goy Veenhuys, Founder of EQUAL-SALARY in the presence of Hirotaka Ishihara, State Minister of Cabinet Office and Jean-François Paroz, Swiss Ambassador in Japan. Picture above : From left to right : Paul Riley, President Philip Morris Japan, Jean-François Paroz, Swiss Ambassador in Japan, Véronique Goy Veenhuys, Founder and CEO, EQUAL-SALARY foundation, Hirotaka Ishihara, State Minister of Cabinet Office and Martin King, President Philip Morris Asia. Picture in title : Véronique Goy Veenhuys, Founder & CEO, EQUAL-SALARY Foundation and Paul Riley, President Philip Morris Japan.